Desirina Boskovich’s short fiction has been published in Clarkesworld, Lightspeed, Nightmare, F&SF, Kaleidotrope, PodCastle, Drabblecast, and anthologies such as The Apocalypse Triptych, Tomorrow’s Cthulhu and What the #@&% Is That?. She is also the editor of It Came From the North: An Anthology of Finnish Speculative Fiction (Cheeky Frawg, 2013), and together with Jeff VanderMeer, co-author of The Steampunk User’s Manual (Abrams Image, 2014). Her next project is a collaboration with Jason Heller — Starships & Sorcerers: A Secret History of Science Fiction, forthcoming from Abrams Image. 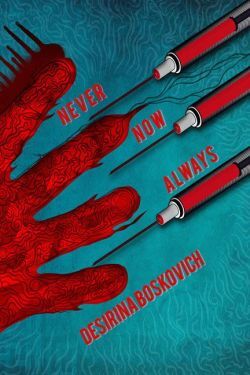 Welcome and congratulations on the publication of Never Now Always! Without giving too much away, would you care to give a taste of what the novella’s about? Thank you! The story centers on Lolo, who finds herself trapped in a futuristic labyrinth, surrounded by children like herself, and their alien Caretakers. She can’t remember how she came to be here or what came before; worse, her memories fade and fragment from day to day, so even much of her time in this place is a blur. The Caretakers appear to be experimenting on the children’s memory, but to what purpose, no one knows. Together with her best friend Gor, Lolo embarks on a desperate search for her lost memories, and then her lost sister, who she is convinced is also somewhere near. Hopefully this isn’t too spoilery, but I’m fascinated by the parallels you draw in Never Now Always between the nightmarish scenario Lolo finds herself in, and the idea of children being powerless in a world of adults. I’m also interested in your recurring themes of memory, time, and the power of stories. Were these themes you consciously set out to work with, or ones you found emerging as the story unfolded? I think these themes have always been at the center of much of my work. I don’t know that I ever consciously set out to work with them, but they seem to be what preoccupies me, and they keep emerging again and again. I know I am not one of those adults who thinks longingly of childhood or feels nostalgia for those days of “carefree innocence.” None of the hardships I’ve experienced as an adult can come close to the constant terror and dread of my childhood with an abusive parent: spending every waking moment trying to navigate a complex set of rules that can change at any time; never knowing when things will go wrong; never feeling safe, never knowing refuge, never having anywhere to hide. And always sensing vaguely that this isn’t right, this isn’t how things are supposed to be, but not really knowing anything else. I guess, in that sense, Lolo’s predicament is an embarrassingly literal exploration of my own trauma. And those few beautiful and blissful memories she recalls mean so much to me, probably too much — an excavation or an echo of that pure and perfect childhood that could never really be. But anyway. Moving past that childhood and building a life that feels safe has been the greatest undertaking of my life so far, and “memory, time and the power of stories” — as you phrased it — feel central to that. And all the stories that feel most personal to me explore these ideas one way or another. Up until now, you’ve primarily written and published short fiction. Is Never Now Always the first step in a new direction, perhaps a novelish direction, or is more a case of the story being the length it needs to be? Heh. I’ve primarily published short fiction. I also have more than a dozen incomplete novels on my hard drive, which is my excuse for not being more prolific in the short fiction department. Idk. Writing a novel is hard. But I hope Never Now Always is the first step in a new direction of actually publishing longer stuff. The novel I’m working on now is Weird science fiction (with a touch of the mystical) about three young people in a cyberpunk-esque surveillance city, surrounded by an eco-apocalypse of unknown origins. I’m in the revising stage and hope to have a final draft this year. Shifting gears a bit, how did It Came from the North come about? Were you working with translated fiction, Finnish work written in English, or both? What was your strategy in selecting works? Was there an overarching thesis, or did you take a ‘best of’ approach? At the time I was a consulting editor for Cheeky Frawg, helping review submissions and pitching in on copyediting and proofreading, stuff like that. The Finnish anthology was a project that Ann and Jeff VanderMeer had been wanting to do for a while. They asked me if I was interested in serving as editor for the project and I said “Definitely!”. At that point my main exposure to Finnish speculative fiction was through Leena Krohn, the utterly brilliant author of Tainaron (which I wrote about in Weird Fiction Review) and Datura (one of the Cheeky Frawg books I helped copyedit, which meant I was lucky enough to be one of the first people to read the English translation). Since then, Cheeky Frawg has released Leena Krohn: The Collected Fiction (2015), which includes several new English translations, and is a truly impressive volume. Anyway, being new to Finnish speculative fiction, I dove into the project and read as much as I could. I read works that were originally written in English, as well as works in translation. I read previously published works, solicited additional work from a number of authors and also read original work in an open submissions period. I don’t think there was an overarching thesis; I chose works that resonated with me, that I felt were memorable and vivid, that I connected with emotionally. At the same time, I did want to select stories that would come together as a coherent whole. What emerged was an aesthetic of weird, quirky and surreal stories with a strong emotional core. By the way, It Came from the North includes an excerpt from Johanna Sinisalo’s Not Before Sundown (published under the title Troll: A Love Story in the U.S.), which I found a very engaging and immediately captivating entry to her work. But I also absolutely freaking adore her novel Birdbrain, which is so weird, disturbing and subtly terrifying. It’s really a masterful work and I want everyone to read it, too. A question I like to ask my fellow Canadians is whether they feel there’s a national character to Canadian speculative fiction. After working on this anthology, do you think there’s a particular national character to Finnish speculative fiction? Are there certain themes, tropes, settings that you don’t see as often elsewhere, or that make a work particularly Finnish? I hesitate to make any pronouncements on what makes a work particularly Finnish — such an insight is probably better left to one of the many amazing Finnish writers working today. But one theme that did particularly emerge for me is the uncanniness of nature, how big and deep and fantastic and strange it really is. This idea that the weirdness of the natural world is in its own way kind of speculative and kind of magical. I think that really comes through in the Sinisalo novel I mentioned above, Birdbrain, where the landscape is both its own character and a reflection of the human characters, radiating tension and dread. And then on the other hand, Krohn’s Tainaron uses the framework of a city of insects to build this beautiful and powerful meditation on life and death, metamorphosis and transformation. I would venture to say that this fascination and exploration of nature and what it means stems from the territory of Finland itself… a country that’s 3/4 forest, home to nearly 200,000 lakes, and positioned partly above the Arctic Circle, with extremely dark winters and extremely bright summers. Incidentally, I will be visiting Finland for the first time this summer to attend WorldCon in Helsinki. I couldn’t be more excited. I hope to spend at least a couple days exploring nature too. In general, one of my favorite questions to ask authors is about their non-writing related work. Authors are notorious for working strange jobs, for example J.D. Salinger’s stint as the entertainment director on a luxury cruise line. What’s the most unusual job you’ve ever had, and did it inspire any stories or teach you anything you’ve used in your writing? This is a wonderful question. I regret to admit, though, that I’ve worked very few unlikely jobs. In high school and college, I worked as a restaurant hostess, a library worker and then an administrative assistant. My first real job out of college was as a copywriter at an allergy products company. I wrote lengthy and enthusiastic reviews of allergy-proof bedding, air purifiers, vacuum cleaners. I have forgotten more about the dust mite than most people will ever know. It was a strange time. But honestly my most formative job was as a fledgling freelance copywriter in the heady days of 2006-2008. Because I was a baby freelancer and my whole portfolio was basically glowing copy about allergy products, I spent some time taking whatever work I could get, little one-off projects, through those online find-a-freelancer sites. The economy was so different then; looking back it feels like they were pretty much just giving away money. And everyone seemed to have some kind of get-rich-quick scheme, some internet side-hustle, some scam they were running. So those were the kind of projects I worked on (I had to eat). Churning out content for hypnotherapy and diet fads and dot.com ventures and pyramid schemes. (So many pyramid schemes.) I was very young then and my perspective was limited but I could feel it, that something was coming. There was this sense of living on borrowed money, borrowed time. Everyone was talking about how we could all will our deepest desires into being if we just believed hard enough. I formed this idea of America as a naive, exuberant, delusional place, distinctly fueled by our fantastical optimism. I tried to write a novel about it, anchored by the characters I encountered through those freelance gigs, but the story was too big. It’s an idea I keep coming back to. But as more time passes the story just keeps getting bigger too. I will write that novel one day, though. I promise. What are you working on next? Anything else you want folks to know about or keep an eye on? The big exciting news is that I’m collaborating on an illustrated nonfiction book with Jason Heller: Starships & Sorcerers: The Secret History of Science Fiction, which will be published by Abrams Books. This book will feature lots of beautiful imagery and tell the stories of unsung creators, forgotten tales, books and films that were imagined and never made, shows that were canceled too soon. It’s a very fun project and I’ll be talking a lot about it over the next year. On the short fiction front, I have two stories forthcoming. “Here Comes the Flood” will be in the anthology 2084 from Unsung Stories. “Cargo” will be in the anthology Ride the Star Wind from Broken Eye Books. And of course, there’s that novel I’m working on. Thanks for having me, and for your thoughtful and interesting questions! It was a delight to talk about Finnish fiction again… and I hope I will see some of your readers in Helsinki this summer.